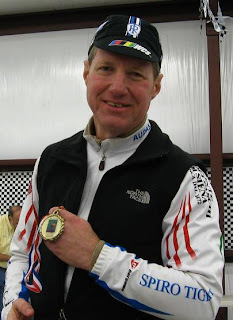 Local PA randonneur Rick Carpenter successfully completed his RAAM qualifier at the Sebring 12/24 race this past weekend. Rick reports: "... At 06:30 on Saturday we started in the dark with three 3.77 mile laps on the Sebring racetrack, then one 89 mile out and back road “long loop”, for an aprox. total of 100 miles. We then transitioned to the 11.67 mile road “short loop”, on which I completed nine laps (or aprox.105 miles). Upon completing my 9th lap on the “short loop”, at around 17:45 we were diverted back to the racetrack to ride the remaining event until the cutoff time of 06:30 Sunday. I completed a total of 54 laps on the racetrack (or aprox. 203.4 miles) at precisely 06:09:28 Sunday morning, when I ended my 400 mile RQ campaign with two “insurance laps” thrown-in. It was very cool by Florida standards, starting with a temperature of around 36 degrees 06:30 Saturday morning, reaching a high of around 58 deg F Saturday afternoon, then dropping down somewhere past freezing early Sunday morning (as evidenced by the frost accumulation on the gear bags). In summary, over my total elapsed time of 23:39:28 I completed 408.4 miles, for an overall average speed of 17.26 mph." More photos are posted here. Race results are posted here.